The river is also known as Gautami and Dakshin Ganga. Today, you come to know about Godavari River History & Origin. Hindu religion is known as the ‘Sanatan Dharma Sanskruti’ developed on the banks of the great rivers. The Godavari is one such river where the Hindu religion flourished and attained to glory. For instance, the River has the blessings of Sage Gautam. Saint Tukaram has sung many praises of the greatness of River Godavari. Moreover, it is said that Lord Shri Ramchandra along with Seeta and Laxman spent 12 years of their exile around the banks of River Godavari. So, River Godavari has an immense historical and prosperous legacy attached to it. In fact, River Godavari is known for the convergence of North Indian and South Indian culture. Moreover, many religious leaders of the ‘Aryavarta’ had spent their lives on the banks of the Godavari River. River Godavari has been the focal point of Hindu pilgrimage. In fact, the Godavari has been described as the eliminator of sins and troubles. Having a holy bath in the Godavari River eliminates all sins and bestows liberation. Even just her ‘Darshan’ eradicates all sins. River Godavari has been the source of great happiness, peace, and joy for millions of devotees from Maharashtra and Andra Pradesh. Such is the greatness of this sacred and holy River Godavari. Words fall short to describe the greatness of Godavari River who is known as the eliminator of sins and troubles. River Godavari is one of the longest rivers in India having a total length of about 910 miles (1465 km). Its drainage basin covers approximately 121,000 square miles (313,000 square km). In fact, Godavari is India’s second largest river. The entire length of the Godavari River is considered sacred by the Hindus. The River Godavari rises in northwestern Maharashtra state amidst the Western Ghats in the Brahmagiri Hills of Nashik District. The river takes an eastward course and flows across the broad plateau of the Deccan (peninsular India). The river covers central Maharashtra and enters northern Telangana state at the northwest of Nizamabad. It continues its journey crossing the borders with Madhya Pradesh and turns southeastward covering its last 200 miles stretch across the Eastern Ghats at Andra Pradesh before reaching the Bay of Bengal. Its whole course from the Western Ghats to the Eastern Ghats has a gentle and somewhat monotonous terrain. The River Godavari receives waters from the Darna, Purna, Manjra, Pranhita, and Indrāvati Rivers. The upper reaches of the Godavari are generally dry during the winters and springs. Some major irrigation and hydroelectric power projects have been developed on the Godavari, including the Jayakwadi Dam in west-central Maharashtra. The Godavari is considered to be one of the most sacred rivers for the Hindus. There are several places on its banks that have been pilgrimage centers for thousands of years. Moreover, in every twelve years, the Simhastha Kumbh-Mela is held on the banks of the River Godavari. Here, we share with you one of the most popular legends associated with Godavari River History. Once upon a time, Sage Gautam lived amidst the Brahmagiri Hills at Triambakeshwar along with his wife, Ahalya in the village named Govuru. The sage used to practice ‘Anna Danna’ which is the giving away of food to the needy. He started cultivating rice crops as well as other crops. Once it so happened that Lord Ganesha following the wishes of other Rishis sent a miraculous cow named “Maaya-dhenu” to the ashram (abode) of Sage Gautam. It looked like a normal cow. The cow began to spoil the rice while Sage Gautam was deep in meditation. When Gautam Rishi noticed the cow in his ashram, he tried to stop her using the “dharbha” grass. Sage Gautam put the dharbha grass on the cow. Much to the surprise of the Gautam Rishi, the cow fell dead in front of her eyes. When other munis and their wives saw this, they shouted at Gautam Rishi exclaiming that he had committed a bovicide (killing of a cow). Rishi Gautam was extremely sad for the event and wanted to atone for the grievous sin that was committed by him unknowingly. He went to Nashik and performed a deep penance (Tapas) towards Lord Shiva in the form of Triambakeshwar. He prayed to Lord Shiva and asked Him to flow the waters of the Ganges over the cow. Lord Shiva was pleased with his penance. He diverted the Ganges towards the cow. It gave rise to the Godavari River in Nashik. What does the Godavari Mean? Meaning: The one who imparted life to a cow (of sage Gautam) is known as Goda (Godavari). Meaning: It was after the completion of 2,00,000 years in the ‘Kruta Yuga’ when King Mandhat ruled the earth, and Lord Sri Vishnu incarnated as Kurma Avatar. This was when planet Jupiter was in the star sign of Leo. It was Shukla Paksha Dashami in the ‘Magh Month.’ It was Monday and time was noon ‘Doon Prahar’. It was then that the Godavari manifested fulfilling the prayers of Sage Gautam on Brahmagiri Hills in Triambakeshwar in the roots of Audumbar tree. The Godavari is the second largest river in India. It is also the longest river in South India. The river starts at Trimbak which is situated in the Nashik District of Maharashtra. The River Godavari takes an eastward course and flows across the Deccan Plateau into the Bay of Bengal at West Godavari District (Narasapuram) of Andhra Pradesh. Triambakeshwar and Nashik are major pilgrimage sites on its course where the Simhastha Kumbh Mela is held once on every ten years. The river traverses through places such as Triambakeshwar, Nashik, Kopargaon, Paithan, Nanded, Adilabad, Rajahmundry, and Bhadrachalam. One of the major multipurpose projects on the Godavari River is located in the Nizamabad district of Andhra Pradesh. It is named as the Sri Ram Sagar Project. There is also a big dam located just after the source of the river at Triambakeshwar in the town of Gangapur. The dam near Paithan is known as the Jayakwadi Dam and regarded as one of the largest dams in the eastern region of India. The dam has successfully addressed the problem of drought in Marathwada region. It has also addressed the problem of flood along the bank of the river. Why is the Godavari known as Vridha Ganga (Old Ganga)? The Godavari is one of the major rivers of peninsular India. It has an eastward flow just like the River Ganges. 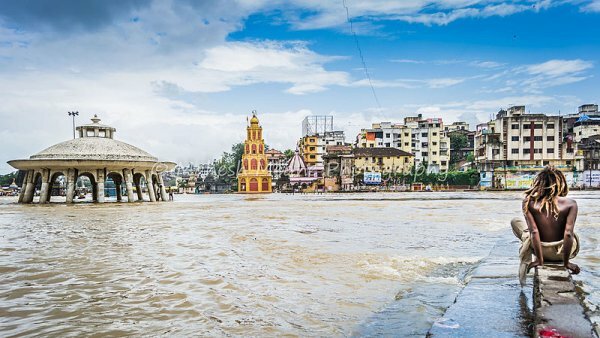 Nashik and Paithan are two of the major holy cities that are located on the banks of River Godavari. In fact, Lord Sri Rama, Sita, and Laxman spent much of their time during their exile near Nashik in the forests of Panchawati. The famous Kumbh Mela is held on its banks every ten years. So, the river Godavari is equated with the holy river Ganges of the North. It is often called the Ganges of the South. The River Godavari is often called Vridha Ganga (old Ganga). The reason is hidden in its origin. In fact, peninsular India was a part of the Gondwana continent. It started drifting northwards and eventually collided with the Eurasian continent which created the Himalayan ranges. All this happened nearly 10 Crore years back. The River Godavari could have been in existence then. However, the northern Ganges originated after the creation of the Himalayan ranges and so is much younger than the River Godavari. That’s the reason for calling River Godavari as the Vridha Ganga. Is the Godavari a tributary of Ganga? The Godavari is referred to the Ganges of the South. It is one of India’s major rivers. The River Godavari is not a tributary of Ganga. Moreover, some of its major tributaries include the Indrāvati River, Manjira River, Sabari River, Moosi River, and Bindusara River. Moreover, the Indrawati, Wardha, Pench, the Kanhan, and Penganga rivers go onto discharge a huge volume of water into the Godavari system. Overall, Godavari has the status of being India’s major river. Hindus regard it a sacred river. Millions of Hindus have a holy dip in the sacred waters of the river. The Godavari is regarded as a holy river and purifies people of all their sins whosoever takes a holy dip in its sacred waters. That’s all we have for you in this exclusive post on the River Godavari. We believe that that you now have got valuable insights about Godavari River. Please do remember to share the post on Facebook, Twitter, and Google Plus. We welcome your comments.